In early 2009 artist/writer and ex-vocalist of Tokyo's DETRITUM, Jeremy Mauney, had the notion to create a black metal band utilizing 80's sci-fi synth-elements and basing song/lyrical content around extraterrestrials and conspiracy theories. After a few months of searching for interested and talented musicians, Jeremy was approached by video game composer and post-black metal band Inlaid Rust's solo member, Roland La Goy. Ideas were soon exchanged, and NUTRITION was born. 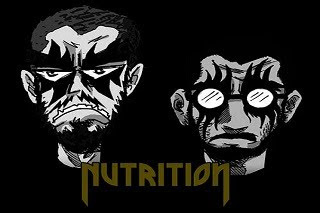 Be sure to check out Nutrition's MySpace... They have two EP's available there for free download.